Having houseflies invade your house can be quite irritating. Personally, I can’t stand the sound of flies buzzing, let alone their sight. They make everything seem dirty. 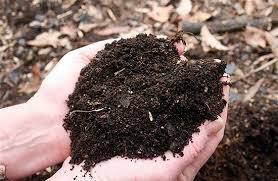 You can’t even have visitors over without them feeling like they have been invited to third world country or a giant compost pile. It goes from bad to worse when food is served, and they parade themselves on your plate, competing with you to get full. This is as annoying as it can get. 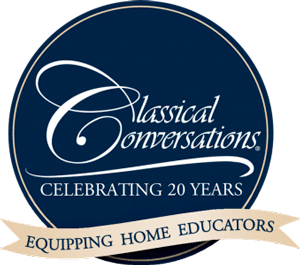 Well, what if I told you I know of a way to steer your house clear of flies by killing multiples of them in minutes. The good thing about this method is that you won’t have to deal with blood stains, since the flies are not crushed. Killing a fly is sometimes close to impossible because of its extraordinary sense of sight. Unlike humans, they have a significant number of visual receptors known as ommatidia. These receptors are arranged strategically on their heads, such that they are conjoined to the brain. Flies can see what is happening around them at an angle of 360 degrees. Their eyes are fast to notice any movement and light as compared to those of humans. This is why when you try to wack them with a dish towel or rolled up newspaper, you miss more often than kill them. Another reason why it’s hard to kill flies is because they fly so dang fast. These critters fly at a speed of 4.5 mph, and flap their wings approximately 200 times in a second. To make matters worse, they can multiply at a very fast rate. A single female fly can lay up to 2730 eggs, resulting in 2730 maggots being hatched all at once. If one fly can produce all those, then what about five of them? You can still beat the fly at its own game by using the following procedure to kill it. Spot the fly – For you to be able to kill it, you must first locate it. Shed more light on it to avoid losing sight of it, otherwise it camouflages with a dark background. One secret you should know is that they are attracted to light. You can manipulate them, and bring them closer to you. 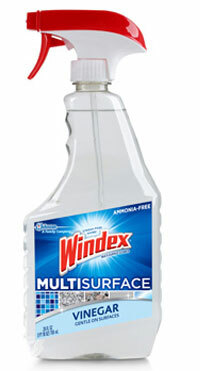 Get a spray bottle of a surface cleaner – The ideal cleaner is one that has vinegar as one of its ingredients such as Windex Multi Surface Cleaner. Hold the bottle ready to spray once the bugger lands. Aim at it from a safe distance, catching it off-guard. The spray will make it go blind, while wetting its wings. This will make it impossible for the fly to escape. 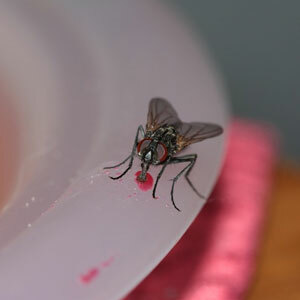 Within a period of 6 seconds, the fly will have been poisoned to death by chemicals present in the cleaner. This method should be used by fly killing “experts” only. If the fly is taking too long to land, spray it while it’s still in the air. You should be a sharp shooter in order to do this accurately. You will require a maximum of four sprays to suffocate the fly in a mist of the deadly poison. If it doesn’t die on the spot, it will definitely slow it down, giving you a chance to swiftly end its life. If you don’t like the idea of spraying a household cleaner all around your house (without actually cleaning surfaces) or you want to feel like Rambo when killing flies, there’s another option. Something I’ve had on my Amazon wish list for a while, the Bug-A-Salt gun, is finally mine. Here’s a good review of the Bug-A-Salt 2.0 which does a much better job explaining how it works. 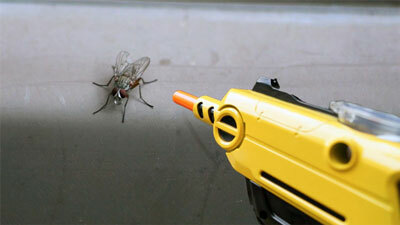 In short, this gun shoots ordinary table salt at a high velocity to kill flies and other small pests. It only has about a 3 foot range but that’s usually a good enough distance where most flies won’t notice you aiming at them. I’ve never had so much fun with target practice. Highly recommended! If you’re still reading, let me explain. Obviously, not every mom of younger kids out there has a gym membership or enjoys running on a daily basis. But if you’re a mom, I bet you do a whole lot of lifting, pulling, pushing, and even the occasional dragging if your kid throws a temper tantrum at the grocery store, zoo, park, or whatever. We sweat… we pant… and we exercise! Unlike at a gym where you can take your time, focus, and watch your form on any of the hundreds of mirrors, motherly exercise most often doesn’t allow for the best form when you have a child on your hip and notice big brother trying to feed Legos to the dog. You twist and lift while off-balance and over time, this causes painful muscles and the ever painful knot that develops behind your shoulders. A few visits to a chiropractor or if you’re lucky, a massage therapist is a pretty common fix to get rid of these aches and pains. There’s a reason why so many moms absolutely LOVE receiving gift certificates to a spa or a massage session, especially around Christmas time. It would be amazing to get a massage on a weekly basis but unless you’re rich or married to a massage therapist, this is pretty much out of the question. Another option is a good heating pad for back pain. I’m not talking about the $15 Kmart heating pad your grandma uses, but rather a high quality infrared heating pad which is the only kind that will heat deep into your muscle tissue. Unfortunately, these seem to start at about $150. What if I told you that there was a way you could spend a few minutes a day to give your shoulders or back a self massage and all it would cost you is about a dollar? Enter the world of trigger point self massage. A friend of mine introduced me to this the last time I had a huge knot right behind my shoulder blades for almost a week. She recommended using a tennis ball to literally “roll out” the knot. 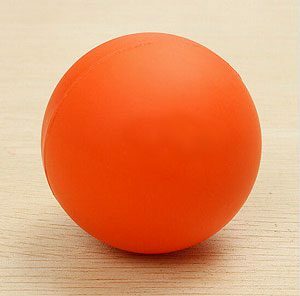 Alternatively, one of those golf ball sized rubber bouncy balls you can get in those gumball machines at some stores works even better. You basically put your back against a wall with the ball between your skin and the wall. Move around until the ball is making contact with the painful, knotty area. Apply some pressure and move your body so the ball is almost flattening the knot on your back. It’s slightly painful but one of those “Oh So Good” type of pains. You can also lay on your back on the floor using the same process. It’s a bit awkward at first but you’ll quickly get the hang of it. Now, whenever I get a knot, I simply get out the rubber ball, and spend a couple minutes 2-3 times a day working on the knot. It really is amazing how effective it is. 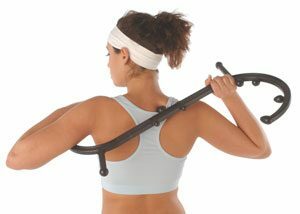 Another option other than a ball that works a similar way is what’s called a Thera Cane. It’s essentially a curved plastic can with various stubs and balls on it which you can use to apply pressure to knots or trigger points. It’s good for those hard to reach areas and you can do while sitting at your desk. I prefer the ball method but others swear by their Thera Cane. September 24, 2016 / Tammy / Comments Off on Rain Rain Go Away! It’s pouring fifty-five gallon drums outside right now. 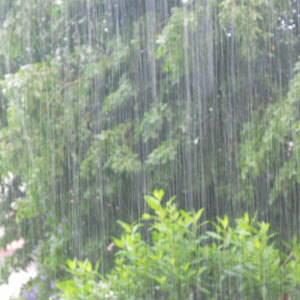 I love the sound of the rain. It produces a very calming effect for me (we recently discussed on Reddit), and always has. At least it let me finish work this morning… But the exchange is the screaming new growth from this rain. My hubby has three sections of corn left to harvest this week, and on section three (the northern most section) the harvesting will be difficult possibly due to the rain, and may require the trailer behind the quad, and a leaf rake. When it rains too much, the portion closest to the crick floods just a bit, and causes me to have to skip it, then next week the length is such that it’s got to be raked out clean. A large area, and always a back ache! A no-stress job huh? And that is one of the most defining aspects of this simple work. He’s had this job for a long time and I know that there are a lot of folks I’ve talked to about this that would love to put us out of work too! Be your own boss, make your own hours too. Every fall is salaried, but he’s in the “on-call” mode for those months. Tough but I gotta do it! We’re also in the process of “updating” our sprinkler system. While we normally wait till winter, we’re having to blow out the system now. Big Bertha (our 60 gallon Craftsman compressor) decided it’s had enough after 10 year. We have a backup Central Pneumatic compressor but it just won’t cut it. Off to Sears in the morning. As much as I prefer the colder months of the year, this time of year is tough to beat indeed. A big plus is the fact that the electric bill is less than the nearly $200.00 a month in the months of moon! Just got the juice bill yesterday, it’s about $62.00 bucks. A mega-difference from January 15th. My sister Shelly and her husband Chris just had their first baby. Such an exciting time! Even before baby Sarah was born, Shelly asked if I could come over and help with her first baby bath. Since I LOVE babies, of course I said yes. So of course what happens? Literally the next day home from the hospital, their water heater started leaking! As if being new parents isn’t hard enough, they now had zero hot water. Fortunately, Chris is a pretty handy guy. Even though the water heater is leaking pretty bad, he knew how to shut off the water right away to keep damage to a minimum. 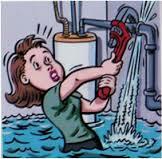 As for the water heater, it’s in the process of being replaced. Most water heaters typically don’t last more than 10-15 years. Turns out that theirs was almost 20 years old! The plumber told Chris that the tank itself was so corroded on the inside, he was shocked it didn’t fail sooner. Oh well, now they can get a newer (and bigger) water heater for their growing family. DO NOT leave your baby unattended. Hopefully this needs no explanation but a baby can drown in only an inch of water in a short period of time. Make sure you have everything you need for the bath ahead of time. Don’t leave your little one unsupervised for even a few seconds. Make sure the water is not too hot. Babies have much thinner and sensitive skin so the bath water should be comfortably warm (check the temperature with your wrist or inside of your elbow). According to Water Heater Hub, 130 degrees is the optimal temperature to set your water heater at. To be even more safe, you can turn it to 120 but don’t leave it that low constantly as it might not be hot enough to kill bacteria that may be in the water heater tank. Keep the bathroom warm. A newborn can get cold very quickly so make sure the door is closed to keep any drafts away. Turn on the overhead heat lamp if you have one. With newborns, will the tub with only about 3 inches of water. Slightly more for older babies. 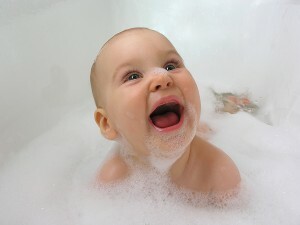 Make sure you use a gentle body wash or shampoo made especially for babies. Teach your baby not to touch the faucet handles or stand up in the bath (if they can). This is how burns or falls occur. All in all, most are common sense although I admit I probably didn’t pay enough attention to the thermostat setting on our water heater. Family camping is a lot of fun, but it can also be stressful too. 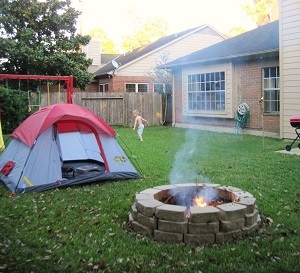 One way to keep things under control is to set up a backyard camping night that you and the kids can enjoy. In order to make the most of the time, it’s important to consider factors like the setup of the camp, the food that everyone will enjoy, and even putting together some games and activities that the whole family can participate in. To make the event as much fun as possible, choose a portion of the backyard that will serve as the campsite. Use the same basic approach that you would use for setting up at a campground. In other words, you would choose to place the tent under a shaded area so it would have a little extra protection from the rain. That shade would also help to keep the temperature inside the tent more pleasant during the heat of the day. You can even set up a fire pit that will be used for cooking. If you don’t want to dig a hole or ruin the grass, you can always have the kids collect some rocks to make a foundation for a Hibachi grill or some similar device. The kids will enjoy helping to get ready to roast wieners or cook other foods on an open fire. We generally have our first “camp-out” after a little spring cleaning in the garage. This year, my husband (the researcher that he is), poured over countless pressure washer reviews on Consumer Reports and other sites and bought himself a new Generac. We most likely had the cleanest back patio in the state after his day of experimenting with it. Since you probably don’t have a creek or lake to use for swimming, there is always the option of setting up a wading pool as part of the campsite. Place some comfortable lounges or chairs on the site as well. That will allow the kids to splash away to their heart’s content, then dry out in the sun. The backyard camping expedition should not make it necessary to keep running in and out of the house. This means packing food and drink for the evening. Prepare an ice chest and make sure it has plenty of ice to keep the sodas and bottles of water cold. For the food, make trail mix, take along some popcorn, and simple things that you can use to make sandwiches. Don’t forget the hot dogs and the buns for the main meal. Round out the list with some potato chips and maybe something sweet. Part of camping is getting away from it all. Since you and your kids are so used to electronic devices, decide to do without them for the evening. That means no cell phones and no electronic games. To keep everyone occupied, haul out some board games and keep a few decks of cards on hand. If anyone in the home happens to be musical, a guitar or similar instrument should also be part of the backyard camping scene. Even if no one in the family is that great of a singer, you can have a lot of fun learning some traditional songs and spending time together. 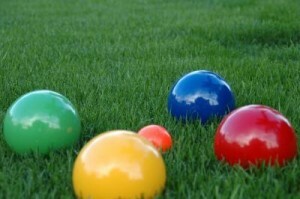 We’re particularly fond of bocce ball. The rules are pretty simple and it’s a ton of fun. While we already have a nice little fire pit, it’s not necessary. You can create a campfire by using two or three flashlights that you stand upright in the stones collected earlier. For more of a fire effect, gather some branches and place them around the flashlights. You won’t have to worry about anyone getting burned or having to have a good fire extinguisher around. At bedtime, everyone gets to make one run into the house for bathroom time and brushing their teeth. After that, it’s back to the tent site and into the sleeping bags. Expect the kids to spend a little time talking and laughing before they finally settle down to sleep. Make sure to turn out the flashlights before you call it a night. When my twin girls were four, my husband and I purchased our first house. We moved in two weeks after our five year anniversary and it was such a wonderful change from the apartment. This new place had more bedrooms, allowing our daughters to each have their own space in time, and the ability for us to begin trying for another baby in the near future. The twins certainly are not ready to sleep alone yet and have never spent the night apart since conception. The one bedroom they wanted to share was a decent size, but really seemed suited to one bed not two. The girls were in their cozy Merino sleep sacks which we splurged on from the Sleep Sack Store and still in toddler beds for the first month after we settled in, and the two toddler beds side by side were okay, with just a little bit of space for a night table in between, but it did not allow for much morning play space or wind down room at night. I recall when I was young that I had a twin bed against the wall, looking across at the corner with my very own bookshelf and a nice comfy bean bag set in the nook and I really wanted that for Allie and Kristy. Jim, my husband, stepped in and came up with the solution before I did, but I admit I was nervous about it. He suggested that we purchase bunk beds that would allow the space to be opened up. He works all day and gets to see the sleepy side of the girls at night when I’ve been home all day listening to their bickering as little girls will do, they complain about sharing, they complain about who can have which dress on in the morning and I don’t even understand that one, I dress them identical! Either way, I knew there would be a battle for top bunk and I was a little nervous about whether or not one of them would fall out from the top bunk having never been up that high before. We’re huge fans of Ikea as half of our furnishings are from there but when we went to the store, nothing really stood out as far as bunk beds. 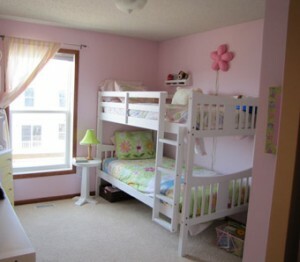 Looking into our options online, we did manage to find one that was perfect, and the height was adjustable with growth. They did fight over who was going to get the top bunk at first, but it was actually easily solved when Kristy won for top bunk and then found out that she was too scared to even sleep up there. She opted for the bottom from then on out. I got to create a nice little reading corner for the girls and a cute hammock over the top that houses their favorite stuffed animals.